What is DRS and why do you need it? Keeping your car as safe as possible is important for all drivers. Car thieves are growing more devious and relentless by the year, and it's important to take whatever precautions necessary to avoid falling victim to them. As an option with your SmarTrack tracker, you can have DRS. But what is it and why do you need it? Put simply, it disarms the alert of the tracker when the proximity tag is near to the vehicle. What this means is that if someone starts your car and drives off without the proximity tag being registered as near the vehicle, it will come to the attention of the Global Telemetrics Control Centre. It's also highly useful in the fight against key theft and helps prevent key cloning. Once the Global Telemetrics Control Centre is alerted they will then put through a call to the account associated with the device to check if everything is OK. If you've just happened to leave the device at home, there's no harm done and they can turn off the alert. If, however, your car has been stolen they can alert you to this - often much sooner than you will have noticed yourself. The police can then be called, and the Global Telemetrics Control Centre can track the car in real time. Helping to prevent your keys from being cloned or your car from being stolen, are obviously pretty big benefits, but the DRS option also has some additional advantages for you to consider. 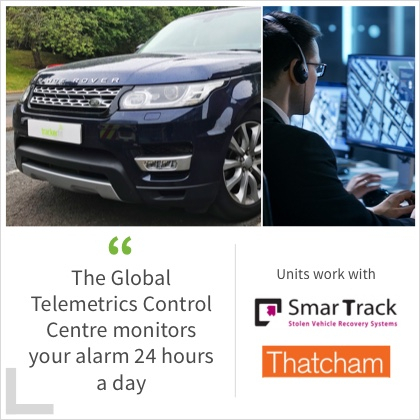 Versatility - The unit will work with all Thatcham Assured SmarTrak tracking devices, which means you get a greater level of choice. Accuracy - The Global Telemetrics Control Centre monitors the alarm 24 hours a day, so if there's an emergency they will know right away. Reliability - The device comes with a one year warranty from the manufacturer, giving you peace of mind that it'll work when you need it most. For more information about SmarTrack tracking products, or what the DRS option can do to benefit you, please contact us today!